Glenavon manager Gary Hamilton Pic by PressEye Ltd.
Glenavon’s impressive league form this season is an end product of consistency developed in many respects thanks to Irish Cup triumphs under the guidance of Gary Hamilton across 2014 and 2016. And the Lurgan Blues boss will return to the knockout format this weekend in pursuit of another short-term success story as a building block within long-term progress plans. 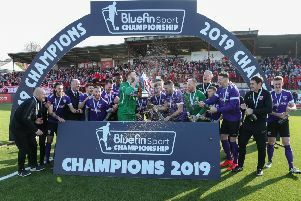 Past trophy triumphs for the Mourneview Park club have helped engineer increased mental strength and a desire for silverware - attributes expected to be put to the test by the Tennent’s Irish Cup fifth-round tie on Saturday away to Carrick Rangers. A visit to the Belfast Loughshore Hotel Arena across recent seasons has offered one of the most demanding dates in the Glenavon club calendar. Failure to secure a summer financial boost off the back of European qualification forced Glenavon officials to adjust the budget and Hamilton entered the current campaign with reduced experience across his panel. Joel Cooper made a return to the club line-up last weekend following a spell in America and Glenavon this week secured Stephen Murray on a transfer from Warrenpoint Town. Glenavon’s ability to negotiate commitments over the two senior Irish League competitions offers another interesting aspect to a cup outing at the end of a gruelling festive Danske Bank Premiership programme. “In terms of handling the challenge of competing across multiple fronts, we adopt the same approach to every fixture,” said Hamilton. “We go into each match with the gameplan and preparation in place towards getting a win. Rangers boss David McAlinden may give recent signing Damien McNulty his debut in the weekend test - but Brendan glackin, another recent addition, is short of fitness. “Damien will come into the squad as long as his international clearance comes through,” said McAlinden. “Brendan will work on his fitness before we include him in the next week or two. “It will probably not feel any different, but in fairness, Irish Cup days are always special. “It’s a nice distraction and we would like more of them obviously, so we’ll have to be good if we are likely to progress, because Glenavon will be decent and looking to come and progress. “Gary has good pedigree in the competition since he’s been there, having won it a couple of times and he always seems to do well in it, but we’ll be looking forward to the tie ourselves. “All we wanted was a home tie, get someone here and make life as difficult as we can.